THE Government will stop the export of unprocessed groundnuts to South Africa and other countries in a bid to promote value addition to the commodity within the country. Flagging off the Citizens Economic Empowerment Commission (CEEC) value chain clusters for groundnuts in Mungwi on Wednesday Commerce, Trade and Industry Minister Bob Sichinga said the Government was determined to stop the trend of exporting groundnuts to South Africa for value addition. He said Government wanted to create a market for small-holder farmers in the country, so that they could produce, add value to the commodity and sell the finished product. 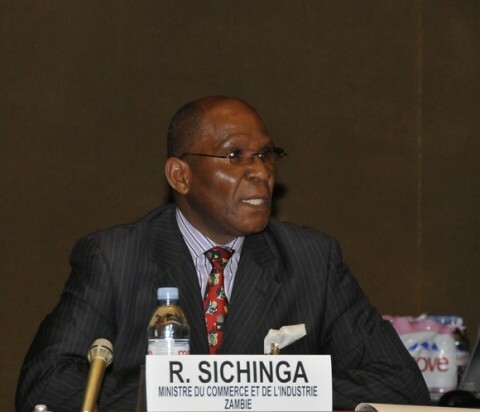 Mr Sichinga said the Government could raise the production of groundnuts in the country from the current 160,000 tonnes to 1.6 million tonnes per annum because it had the potential with ready market. Mungwi District has the potentially vibrant groundnut subsector with annual primary groundnut production of 3,777 tonnes and annual yield of 0.58 tonnes per hectare. There are about 15,832 small-holder groundnut farmers in Mungwi district, but currently there is no significant processing of groundnuts taking place apart the processing of peanut butter and cooking oil. “And that is why we are giving you equipment from CEEC so that you begin to produce quality groundnuts. We are also bringing PACRA into Kasama to help you improve on your businesses. “You will be strengthening my hand if you use these funds wisely because it would be easier for the ministry to request for more funding from the Ministry of Finance to fund other projects,” Mr Sichinga said. He said it was for this reason that he had arranged for a meeting with management officials from chain stores like Shoprite, Spar and Pick n’Pay to persuade them to stop importing peanut butter from South Africa. Mr Sichinga told the gathering that Government would build an industrial cluster where the factories being set up would be. He said the cluster would also house CEEC, Patents and Companies Registration Agency (PACRA), Zambia Revenue Authority (ZRA) and Zambia Bureau of Standards (ZBS) to assist beneficiaries run their businesses. Mr Sichinga challenged the small-holder farmers in Mungwi to take advantage of the favourable weather conditions and increase groundnuts production. And CEEC director general Likando Mukumbuta said the commission was promoting value addition in the district to help uplift people’s living standard. About 42 value chain cluster projects in Mungwi District have been funded. Northern Province Minister Freedom Sikazwe said that Government was happy that value chain cluster concept was beginning to bear fruit.